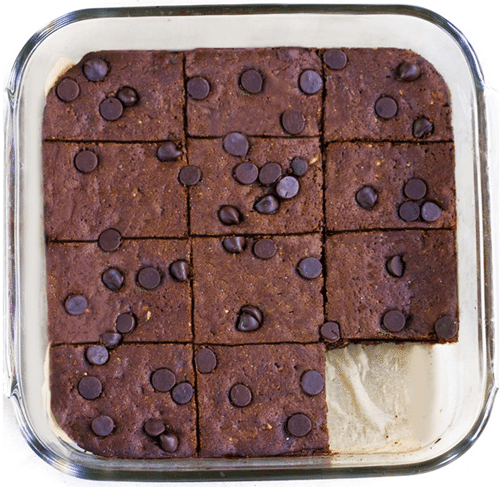 Ooey gooey, melty, chocolatey unbaked brownies – the perfect recipe for those days when you just really need a brownie! And if you’re anything like me, that would be every day. Good thing these babies freeze well! 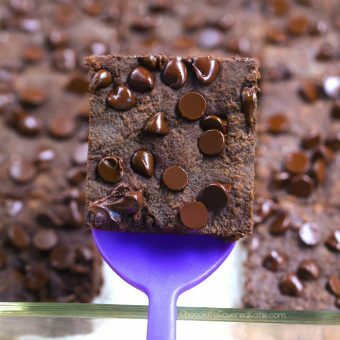 Brownies are my Kryptonite. I love them even more than chocolate chips cookies. 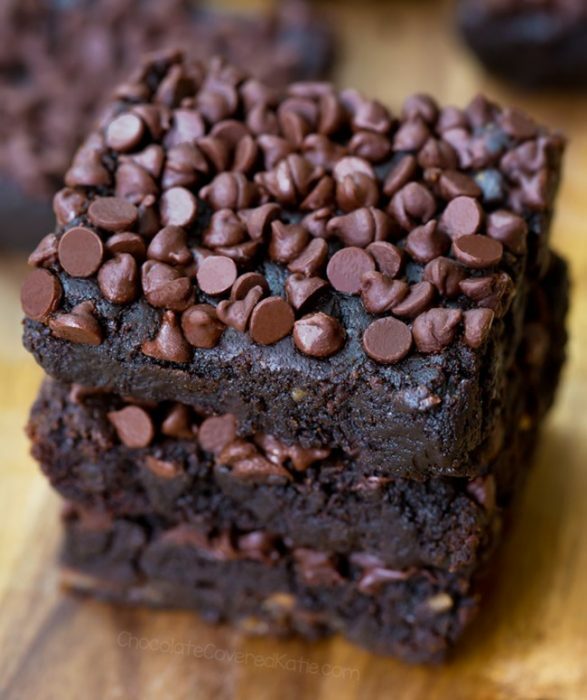 Think about it: you only get a small amount of chocolate when you eat a chocolate chip cookie; whereas with a brownie, the entire thing is melty, gooey chocolate. 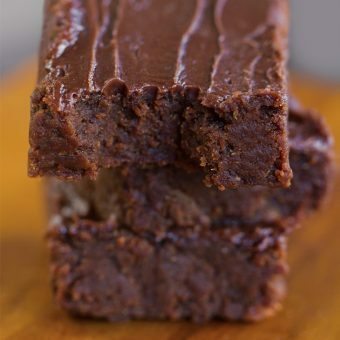 But if you read my recent post that showed an example of What I Eat In A Day, then you know brownies—as much as I adore them—aren’t the only thing I eat. 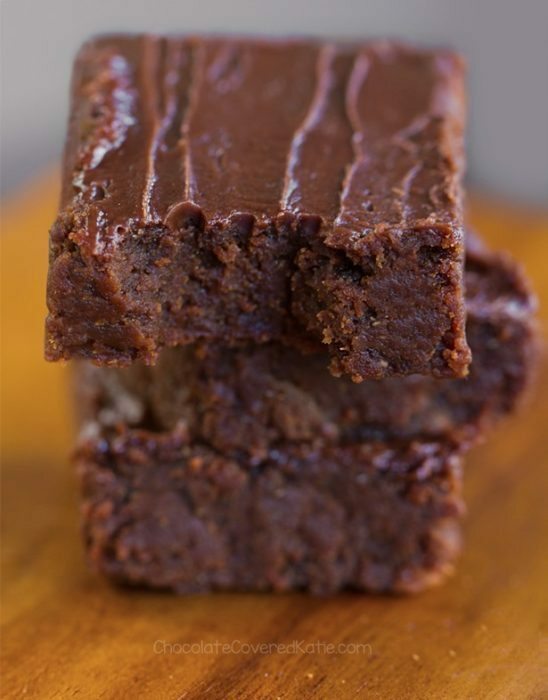 The recipe for these unbaked and raw brownies comes from the Chocolate Covered Katie Cookbook, and I’m posting a recipe from my first cookbook today as an introduction to revealing the news that a second cookbook is currently in the works. 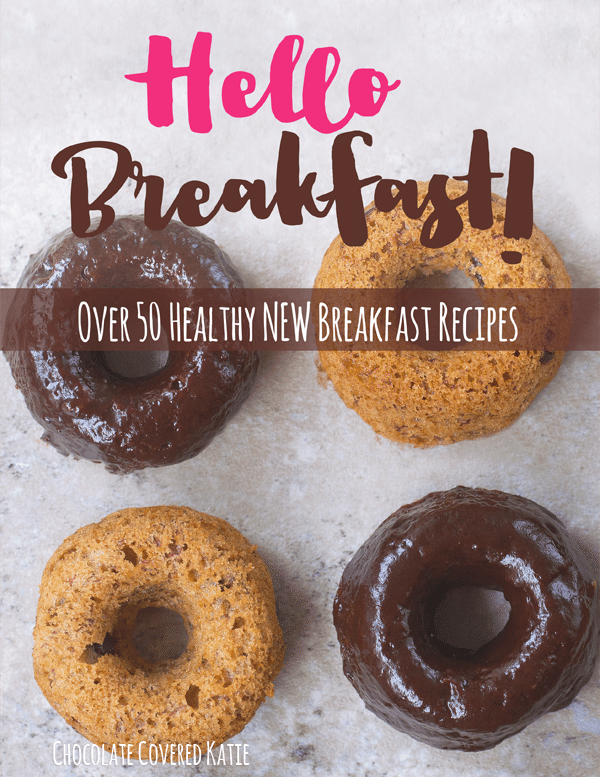 And, thanks to an overwhelming reader demand, the new cookbook will include not only desserts, but also over 100 healthy, wholesome, and plant-based meals. 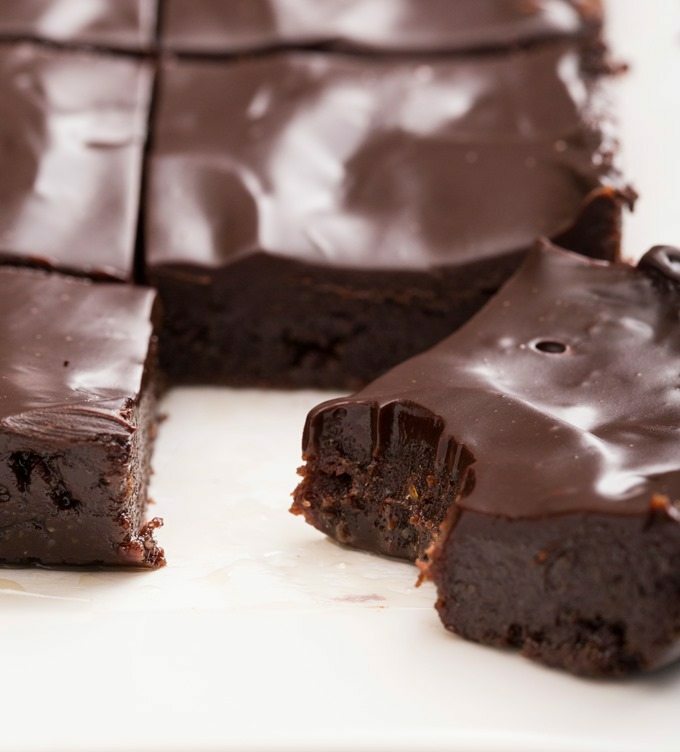 They take 5 minutes to prepare and can be raw, gluten-free, egg-free, dairy-free, soy-free, and vegan. 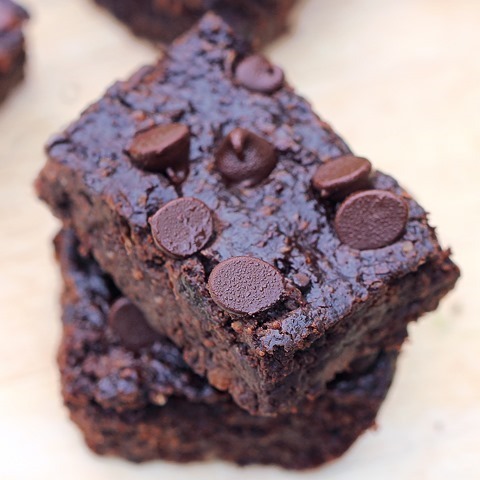 But more importantly, they taste somewhat like the cross between a brownie and a chocolate candy bar! If you make them and post a picture, feel free to tag ChocolateCoveredKatie on Instagram so I can see and like your photos! Leftovers (if there are leftovers… how could there possibly be leftovers?!) 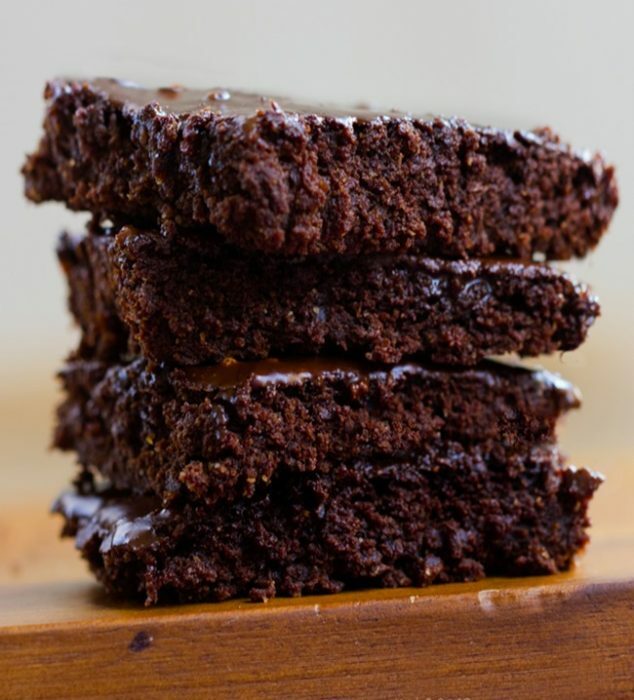 can stay out for a few days, making these brownies a fantastic option for a bake sale or to ship to faraway friends. 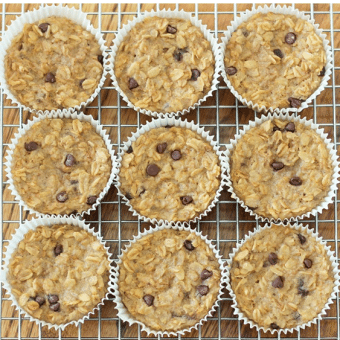 I’d recommend shipping them unfrosted or simply spreading melted chocolate chips on top if they’ll be left out for an extended period of time, as coconut oil will soften when warm. 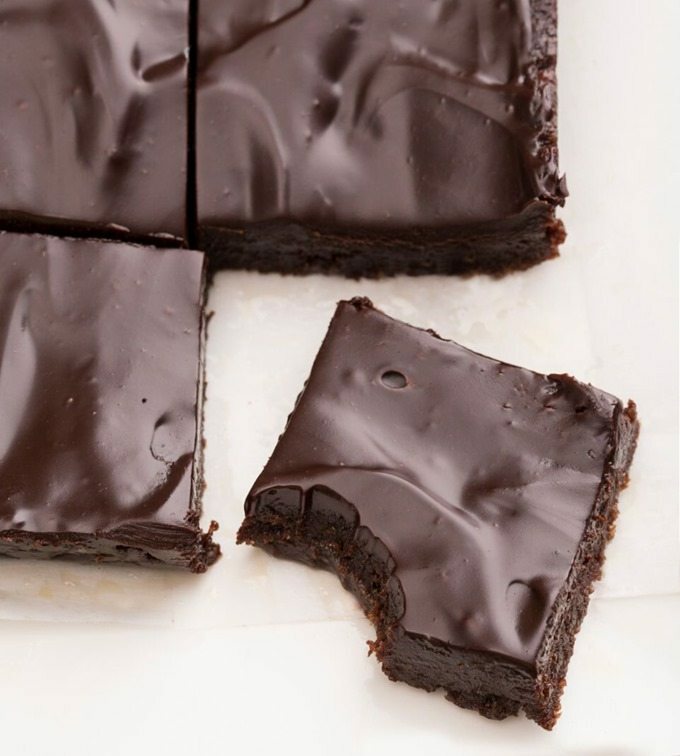 You can also refrigerate these brownies for a few weeks, or you can freeze them for up to 2 months or more. 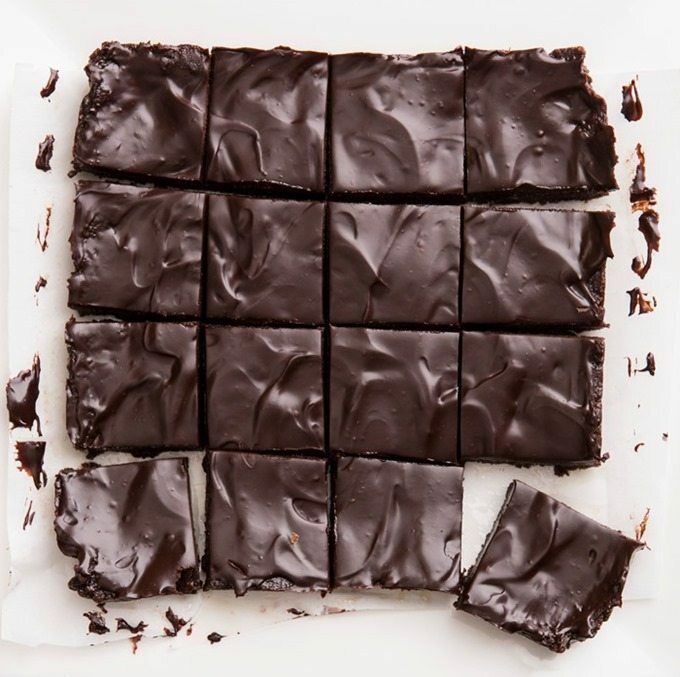 But seriously, who has the willpower to keep brownies that long without eating them all first??? Combine the dates, walnuts, 6 tbsp cocoa, 1 1/2 tsp vanilla, water, and salt in a food processor. (This is the food processor I use.) Process until completely smooth, scraping down as needed – It may seem dry at first, but don’t add any extra water. 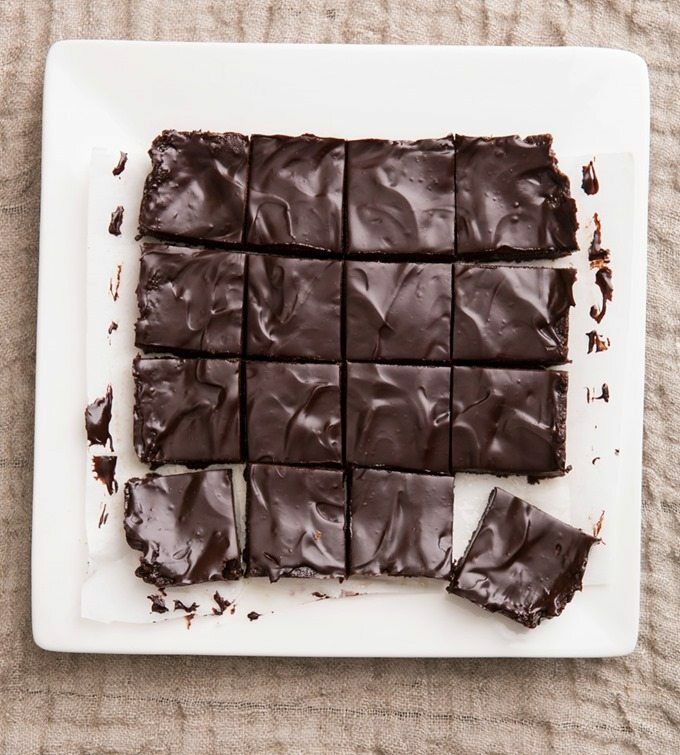 Lightly grease an 8-inch square baking pan, or line the pan with parchment or wax paper. Transfer dough to pan and press very firmly until dough is evenly distributed in the pan. In a medium mixing bowl, combine remaining cocoa and vanilla extract with the maple syrup and oil. Stir until mixture forms a paste (this is the frosting). Spread evenly over dough in the baking pan. 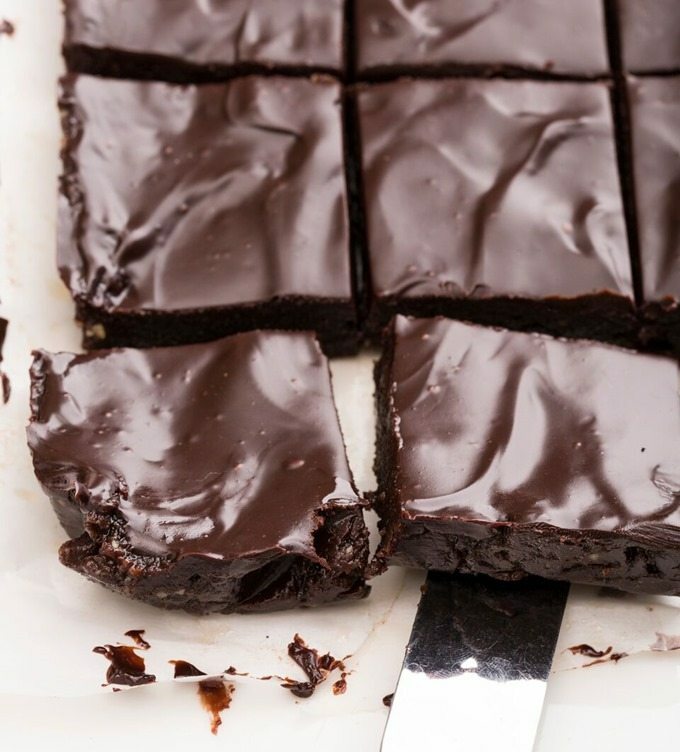 Refrigerate brownies for at least 2 hours, to set. Leftovers can stay covered at room temperature for a day, or up to 2 weeks in the fridge, or 1-2 months in the freezer. That is great news! Do you have any idea when the new cookbook will be ready? I can’t’ wait! It will probably be at least a year. Right now is the fun part of creating recipes. Cups measure by volume, don’t go down the weight path, too complicated for wet and dry ingredients. Slayed this recipe with Organic Honey in place of maple syrup…and made some with maple syrup too. Both equally delicious. Now to keep my pregnant wife from eating all of the next batch! 🙂 This just made my week. I love your blog, but the recipes I find myself drawn to on your site are 99.9% of the time the savory recipes. We aren’t huge dessert people in my house and only will bake sweet treats very rarely or for events, but the sweet potato chili, lentil sloppy joes, baked mac and cheese cups, cool ranch hummus, and about a million others are staples on our menu. I can’t even tell you how excited I am to hear you’ll be offering more savory recipes in the future. We will be first in line to buy your new book. Congratulations! Congrats on the new book! Love your first one! I’d love to see healthy snack ideas (muffins, energy bars, roasted chickpeas, etc.). I always love to have plenty of plant-based snacks around. YAY! If we could preorder right now, I would do it in a second. I have your first book but am even more excited about a “meals” book. I’ve been trying to eat vegan once a week, and this would be so helpful!!! Congratulations! Do you think it’ll be out this year? I’d love to buy a few copies as Christmas gifts! Love your suggestion… I’ve never made my own Pad Thai but will add it to the list of things to try! So you’re telling me I can make chocolate frosting out of cocoa powder, maple syrup, oil and vanilla…?!!!!!!!!!! Day made!!!
? ? ? 😀 😀 LOL , made my day too. Another commenter said she had great results with raw cashews! I used almonds and it was great, though I’d imagine walnuts would be even tastier! It’s looking so good ! Can’t wait to try it ! Can it be 2017 yet?!?! Or do you need any taste testers? I’m so excited for this! YUMMM!! You are queen of baking! Congrats on the new book! I bought your first one – love it – and I think it’s great you’re going to include savoury recipes in your second book! Especially as I love your savoury recipes ? Your pumpkin mac n cheese, homemade spaghetti o’s, portabello burgers…I could go on, but know this, even my meat-eating boyfriend loves them so you’re definitely doing something right! 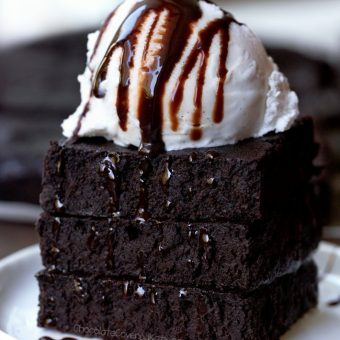 As for these brownies, they are the perfect recipe to make for my Mom when I next see her as she’s a chocoholic! Thank you so much for all of the suggestions!!! YAAAAAAAAAAYYYYY!!!!!! I was wondering if you’d ever do a second cookbook! And I LOVE that you’ll include savory meals, too! Thank you, Katie!!! I make these often. So delicious. My mouth is watering! I swear chocolate is my boyfriend :-).